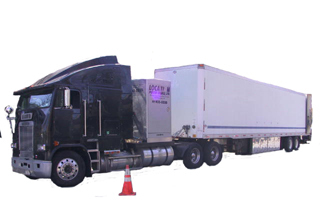 Our lighting and grip trucks are late model cabover diesels and are outfitted with the latest production equipment handling technology. To efficiently organize our large equipment packages in their oversized boxes, our grip trucks are outfitted with Backstage equipment carts, light hampers (w/ oversized casters), muscle trucks, oversized "cable style" jockey boxes, and a custom B-Line shelving. To make loading quick and easy, the trucks feature extra large "level lift" power tailgates, side doors and interior/exterior worklight systems. Trucks are available with onboard Crawford movie blimped generators or are capable of towing our complete line of trailer mounted generators. Our trucks come stocked with a complete inventory of expendable supplies on a pay-as-used basis. We are the only rental company in N.E. to stock sheets of gels and diffusion on our trucks; and sell gels and diffusion off the roll by the foot. 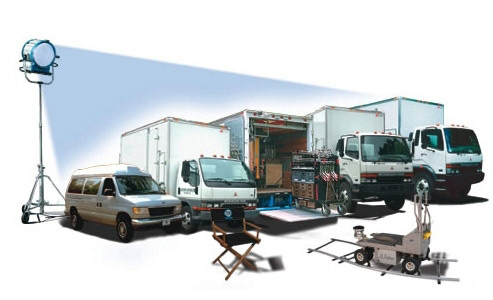 12-Ton Location Lighting & Grip Packages. Cover Set Lighting & Grip Packages. 10-Ton Lighting and Grip Pkgs. Grip & Electrical Pkg ............. $600. Quartz Pkg (additional) ................... $450. 10-Ton Lighting & Grip Packages. 5-Ton Lighting and Grip Pkgs. Grip & Electrical Pkg ............. $425. Quartz Pkg (additional) ................... $425. 1000A Onboard Generator .......... $750. Designed to serve commercials and large industrials, our larger 5-Ton Lighting and Grip packages are available in a standard truck box or with an on-board 1000A Crawford Generator. Both style of trucks are designed to allow quick access to our extensive inventory of state-of-the-art production equipment with an extra large power tailgate, jockey boxes, and taco carts. All our trucks come with an extensive pay-as-used expendables package. 5-Ton Lighting & Grip Packages. 3-Ton Lighting and Grip Pkgs. Grip & Electrical Pkg ............. $300. Quartz Pkg (additional) ................... $150. H.M.I. Pkg (additional) ................... $385. 250A Onboard Generator .......... $350. 450A Tow Generator ............ $535. Designed to serve small commercials and industrials, our larger 3-Ton Lighting and Grip packages are available in a standard truck box or with an on-board 250A Crawford Generator. Both style of trucks are designed to allow quick access to our extensive inventory of state-of-the-art production equipment with an extra large power tailgate, jockey boxes, and taco carts. All our trucks come with an extensive pay-as-used expendables package. 3-Ton Lighting & Grip Packages. 1-Ton Lighting and Grip Pkgs. Grip & Electrical Pkg ............. $120. Quartz Pkg (additional) ................... $100. H.M.I. Pkg (additional) ................... $225. 180A Tow Generator .......... $250. Designed for fast-paced productions, our van pkgs. carry the essentials you need. Match the Grip & Electrical Package with complementary Quartz and/or HMI Packages, and you're ready to "run and gun" with the help of an experienced driver/grip, rolling equipment cart, and a modest expendables package. Van pkgs. are also available for pick-up or delivery without a driver/grip and expendables. 1-Ton Lighting & Grip Packages.